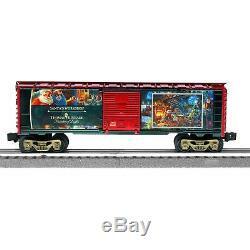 Lionel Trains Thomas Kinkade Christmas Ready to. PERFECT GIFT FOR THE HOLIDAYS. 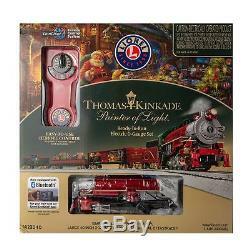 Capture the spirit of Christmas the way only Thomas Kinkade can with this charming Ready-to-Run Lionel train set! 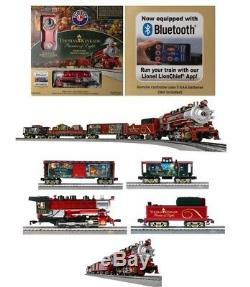 From the front headlight on the 0-8-0 locomotive to the back railing of the caboose this set features intricate details, and a paint scheme inspired by the 2017 Thomas Kinkade painting Santa's Workshop. Watch the elves chase each other around the Gondola, open the boxcar doors and imagine what it would be like to be on a real steam-powered train as smoke billows from the smoke stack! The LionChief remote allows you to control the locomotive and activate the various train sounds and passenger announcements. If you have a smartphone or tablet, you can control the locomotive directly from your device by downloading the free LionChief app! The large oval track design features Lionel's FasTrack construction which offers straight-forward assembly, so you spend less time on setup and more time watching your train chuff on down the line. Everything you need to get started is included. Electric locomotive controlled by LionChief remote. 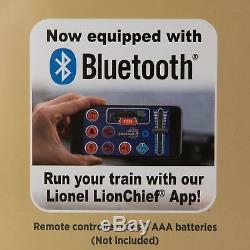 Built-in Bluetooth allows you to control the locomotive via your smartphone when you download the LionChief app. RailSounds RC sound system with steam chuffing, background sounds, whistle, bell and user-activated announcements. On/off switch for sound and smoke. Forward and reverse speed control knob. Three buttons to activate whistle, bell, and special announcements. Remote control requires three (3) "AAA" batteries for operation. (Batteries Not Included) Phillips screwdriver required to access battery compartment. FasTrack System has a fantastic prototypical look, is easy to use and features a snap-together locking mechanism for tight, reliable connections. High level of assembly required - approximately 15 minutes. 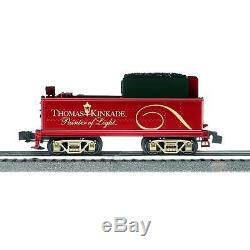 Thomas Kinkade 0-8-0 Locomotive and Tender. Santa's Elves Chasing Gondola. 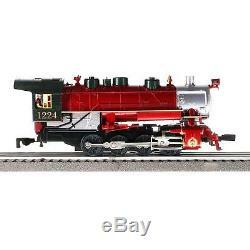 Locomotive: 10-1/2"L x 2-1/2"W x 3-3/4H; 2.36 lbs. Full Train: 47-3/4"L x 2-1/2"W x 3-3/4H. Track Layout: 60" x 40". It is important to keep the track and wheels free from grease and dirt. Wipe them with a soft lint-free cloth whenever they get dirty. 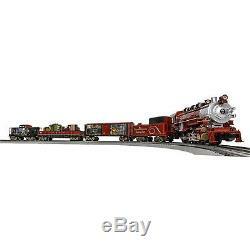 This will allow your locomotive to run more efficiently. Lubricate the wheels, axles and linkage regularly to avoid squeaks and wear. Remove all batteries when the train will not be used for an extended period of time. FOR AGES 14 AND UP ONLY. Not For Children Under 3 Years. Please save all the packaging until you have completed the installation and you are satisfied. By leaving negative and neutral feedback you damage our business and increase overall prices. If we cannot compete with our super low prices, our competitors will raise their prices. We loose and you loose. We are trying to build a business and relationship with all of our customers. You are in good hands and we will fight to make you a returning customer. Thank You for Your Business! Please Come Visit Us Again! 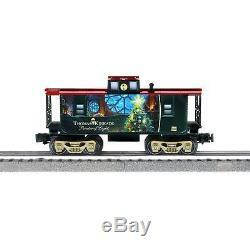 The item "Lionel Trains Thomas Kinkade Christmas Ready to Run LionChief Train Set with Bluet" is in sale since Tuesday, November 20, 2018. 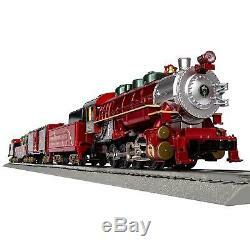 This item is in the category "Toys & Hobbies\Wholesale Lots\Model Railroads & Trains". The seller is "true_beauty_store" and is located in South Ozone Park, New York. This item can be shipped to United States.